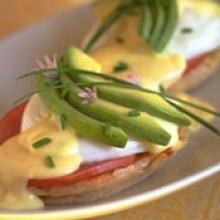 Easy Blender Hollandaise and Eggs Benedict 45 Ways! Make it anyway you want! Eggs benedict is one of those dishes that I always ordered at brunch because I thought it was too difficult to make at home. I had always heard Hollandaise sauce was tricky (why else would they sell the version in those little packets?) and since my daily breakfast generally comes from the blender, I was too intimidated. Turns out, you can make easy hollandaise sauce right in the blender! And by making it at home, I can ensure my perfectly poached eggs, favorite hot sauce, and beloved Hass avocado on hand too. Not to mention, save a few bucks and drink all the Bloody Marys I want. Potato cake (great made from leftover mashed potatoes). Just form patties and pan fry in a few Tbsp Kelapo coconut oil until brown. Gluten free and delicious! Portabella mushroom (an excellent source of Vitamin D and meaty enough to replace the bread AND meat!) Just place portabella mushroom caps on a cookie sheet and roast in a 400 degree oven for 15-20 min until tender. Next comes the poached egg. I got this right on my first try, because I followed the directions. If you do, your poached egg will come out perfectly “saucy” (not too runny or firm) every time! Start by heating 3” of water to simmering (tiny bubbles rising from the bottom). Crack your eggs into separate bowls and have them ready to go. Swirl the water with a big spoon so it becomes a whirlpool, and before it slows down, gently slide one egg at a time into the water. I usually do two eggs swirling at the same time. Leave each egg in the swirling water for exactly 2 ½ minutes, then remove with a slotted spoon and drain on paper towels. Place egg yolks, lemon, and salt and any additions in the blender. Blend for 30 seconds before streaming in the melted butter. Serve immediately. Last but certainly not least, a couple slices of Hass avocado (or go crazy and mash it up), for the crowned jewel of this breakfast masterpiece. Try one of the above combinations and let me know how it goes, or tell me your favorite Benedict variation!